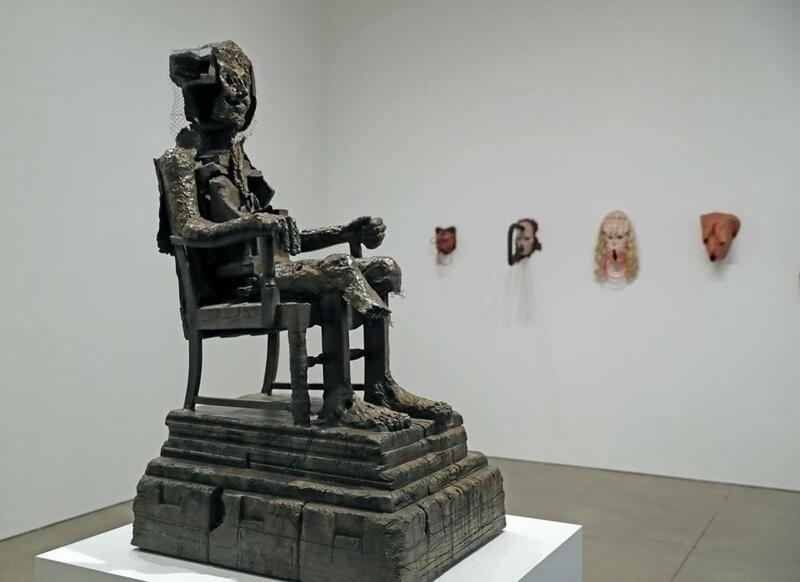 Huma Bhabha’s exhibit “They Live,” at the Institute of Contemporary Art. Huma Bhabha’s new show at the Institute of Contemporary Art is called “They Live,” though you have to wonder how. Vaguely human figures are charred, shattered, dismembered; limbs and heads are cut loose from bodies. One piece looks like nothing so much as a roughly-flayed fillet of overripe meat hung on a grimy white plank with bleached animal horns. She calls it “Special Guest Star;” it’s wearing a grubby blue T-shirt turned inside out, if “wearing” can be a term applied loosely. Even so, there’s something vaguely decadent about it, a regal recline at the edge of the apocalypse. Bhabha’s works are gruesomely visceral, with death never further than arm’s length. But they’re also exuberant, dynamic, and playful, in their rough-and-tumble way, alive with the verve of making. “They Live” is operatic with its changes of pace and key: It can be deafening and manic, or hushed and somber. Here and there, you might even extract a drop of black humor, though the laughs are pretty grim: On a plinth of blackened planks, a pair of wooden legs limp alongside a disembodied head dripping its pink-clay flesh from a metal-wire skull. She calls it “Bumps in the Road,” after an American soldier’s quip about driving along dusty byways during the Iraq War. The bumps were bodies, left to rot in the desert. You get the picture. Death as the product of war looms large in Bhabha’s work, a matter-of-fact feature of our everyday for years. So does the history of art, and you’re not wrong to see echoes of Francis Bacon reverberating through “They Live.” Thick, flaking strips of pink and gray splayed on a plinth in Bhabha’s “Unnatural Histories” make me think of Bacon’s tangled, deboned, de-limbed mounds of hot flesh; Bhabha’s chilling woodblock print of a black-stained seated figure looks like a straight homage to Bacon’s chilling series of portraits of Pope Innocent X, packed in a box, screaming. “I lived through the revolutionary Irish movement, Sinn Fein and the wars, Hiroshima, Hitler and the death camps and daily violence that I’ve experienced all my life,” Bacon once said, reflecting on his time spent in the London Underground tending to the wounded during the blitzkriegs of World War II. “And after that they want me to paint bunches of pink flowers.” Bhabha can surely sympathize. 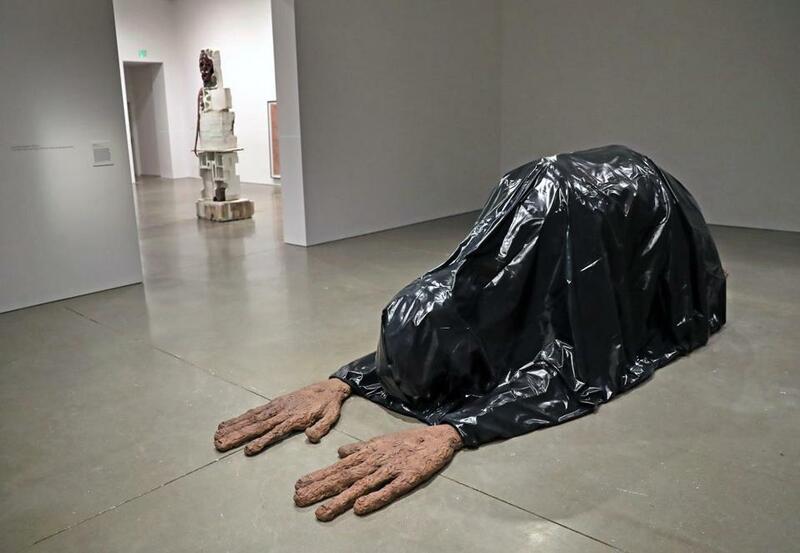 Body bags with the remains of American soldiers being unloaded routinely for the TV cameras during the Iraq War provoked one of her most powerful works, and most restrained: “Benaam,” from 2018, a huge bent-over bronze figure shrouded in shiny black, its meaty hands laid flat in front of it. Huma Bhaba’s “Benaam,” at the ICA. It was made for the rooftop of New York’s Metropolitan Museum last year, where it crouched in front of one of the artist’s towering idols carved from cork (together, she called them “We Come in Peace,” an acidic double-entendre that bundled up Bhabha’s twin fascinations in science fiction and war). At the ICA, it holds a room of its own, sandwiched between galleries alive with multiple works and outright carnage. If you have anything like a soul, it’ll stop you dead: Alone and cast in low light, the piece is somber, affecting, reverent and abject; the figure either in prayer or surrender, last resorts both. Its material counterpoint — the slick black shroud, the texture of the hands, rough and worked-over — amplifies its heavy presence. It seems to straddle two states — both alive and dead, transforming, becoming. A slim tendril projecting from its rear suggests a tail; a closer look reveals it to be carefully built from curled bronze lumps. Bhabha offers, matter-of factly, that the body’s bowels release at death. Bhabha’s not the first artist to fixate on the bottomless capacity for human cruelty and its aesthetic potential. Carnage rivets; how else to explain the horror industry, of which Bhabha herself is a keen fan? (She cites David Cronenberg, he of the exploding heads in “Scanners” and the creepy ectoplasmic clone pods in “The Brood,” as a primary influence). Look further back and you’ll be able to draw a longer artistic lineage, through Bacon to Jean-Michel Basquiat to Alberto Giacometti, Otto Dix, and the tiny horrors of Hieronymous Bosch. Picasso’s “Guernica” comes to mind, a vast tableaux of explosive brutality; I’d describe “They Live” in much the same way. Bhabha works intuitively, but with history in mind. The first piece you’ll see is “The Orientalist,” a partly-reconstructed bronze cyborg with nubbly Giacometti-esque flesh clinging to its mesh hide. The title’s a nod to the Palestinian-American writer Edward Said’s critique of Western fascination with Eastern exoticism — with which Bhabha, who grew up in Karachi, would be well-acquainted. It’s bronze, but in a state of decay; she won’t give anything away, but it seems to say much about the erosion of Western dominance — not a bad thing, given the work that waits a few rooms away. But Bhabha roots herself as much in sculptural tradition as political discourse. Let yourself cool off from all the carnage and you’ll see a classical structure of sorts: The first room holds standing figures, made of styrofoam and cast bronze; another, mise-en-scenes on plinths. One gallery is given over to the artist’s exploration of the ancient convention of bust-making, in her own unique way (My favorite: “Fear Eats the Soul,” from 2007, ochre skin clinging to chicken wire wrapped around styrofoam with a VW emblem in its mouth). Bhabha sees herself as part of a continuum, adding her voice to the lineage of all that’s gone before, so it shouldn’t surprise that the final gallery here feels almost ancient. Giant idol-like sculptures carved from cork evoke a lost civilization; one, “Waiting for Another Game,” from 2018, stands 10 feet tall. 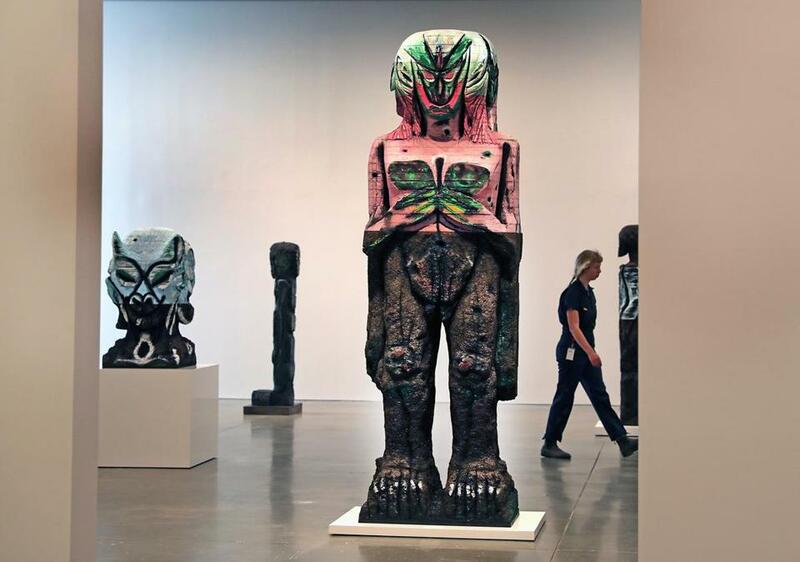 Hot pink with a face on each of its four sides, she’s a goddess, though of what I can’t say; though Bhabha seems to be toying with another bit of art history, the Surrealist’s love of “primitivist” expression, which they believed to be the product of a collective unconscious. It was an idea both precious and wildly condescending, and I don’t think I’m wrong in seeing Bhabha’s sci-fi totems as a sharp critique: primitivist aliens, radically advanced, come to collect their kind and leave this world for somewhere better — as though there could be much worse. It all makes perfect sense: Through the bloodshed and carnage, Bhabha’s creations live as expert survivors, with the end of days just a breath away.